I hate flying. I hate flying for several reasons. For one being transported like sheep in a truck. For another the being processed like a parcel – moved around on conveyor belts, weighed and stamped, shunted from one tedious wait to another. The apparently glamorous ultra-modernism of grand airport terminals is hardly a compensation, saturated as they are by advertising and all the vulgar excesses of rampant consumerism. Worse of all is that, like the tube system in London, the indistinguishability of one airport from another makes them part of a globe spanning system that annihilates the very point of travelling: the sense of movement and the meeting with the other. You pop into one end of the system, are processed, and extruded at the other end like sausage meat. I talked to a teacher on the plane and she told me that she had a map of the world that she showed her pupils who had flown off to Gran Canaria and had no idea whatsoever where they were when they were there. As I have written elsewhere, it seems to me that this virtual relationship with the planet is going to bite a large chunk out of us. Don’t worry, my posts from my travels are – I believe – unlikely to be as grumpy as this one is turning out to be. Of course I am likely to have ‘moods’ – being as I see it is my job to absorb everything I can – and that is going to have to include the bad as well as the good… And let’s face it, our planet isn’t exactly the Garden of Eden at the mo. So, if you don’t mind, a little more ‘down’ before I swing into the ‘up’. I was conscious when planning this expedition that I would most likely be flying – and I know that flying is bad for the planet. I did look into doing the whole thing by train – but the cost and time are prohibitive; the former should perhaps not be so, but there it is. It seems likely that, in our lifetime, this business of flying off to a place as far as Istanbul for a couple of days – the teacher was doing just that – is going to collapse. Not that anyone would guess that was even possible with newer and bigger airports being built everywhere. But one of the things that amazes me is how, over the years, the amount of baggage people take with them has increased to absurd proportions. No doubt, defining ourselves, as so many of us do now, by the things that we own, we must, like good Queen Bess, pack everything – down to bedding, silver plate and the tapestries from our walls – every time we go anywhere; perhaps we are trying to mask an anxiety that, without our objects around us, we might loose our identity. 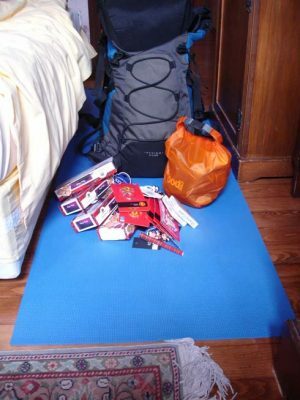 Surely, one of the core arts of nomadism is packing. There is a liberation in only carrying what you – or your quadruped – can carry. It seems to me that there is a pressure here towards minimalism – where elegance is achieved through form following function – and where relocating substantial objects and comforts is seen as the extravagance of kings. Fossil fuels, here and elsewhere, by removing this need to operate within one’s means, leads to all manner of excess – here a gluttony of packing. One of the beauties (perhaps virtues?) of backpacking is that it represents a return to the principle that you can only take what you can carry yourself. In the attached photo you can see what I have taken with me. Aside from my backpack, you can see the little orange sack in which I am carrying all the leads that, alas, a techno-nomad (in this current iteration) is compelled to have with him. There should also be my ‘little green bag’ that I’ve just noticed I forgot to put in the shot. The heap of other stuff is tat; both Scottish and football related, that Lloyd, an experienced ‘Iran hand’ advised me to take to distribute among the various children I am likely to encounter. Though this is a sentiment I applaud, the business of buying the stuff and lugging it around somewhat goes against my ‘religion’. A final thought, before I go and experience Justinian’s sublime basilica – the historian Arnold Toynbee proposed a theory of ‘culture and transmission’ in which he postulated that the relative rates of cultural innovation and those of transmission determine how diverse culture becomes across the planet. He said that in the Neolithic, though the rate of transmission of cultural ideas (including technologies) was incredibly slow, the rate of innovation was even slower so that, effectively, a single culture spanned the whole globe. Later, when the rate of innovation began accelerating, regional centres generated cultural innovation faster than it could be transmitted and so we ended up with extremely distinct cultures: China and Rome, for example. The European maritime expansion, beginning in the 15th century, greatly accelerated a transmission that has gradually eroded cultural diversity. This so called process of ‘globalisation’ is churning ever faster and soon we will have a mono-culture dominating the planet. I abhor this – at least where it concerns culture – and am travelling to try and see some of this ‘other’ before it disappears. The irony, of course, is that by so doing I am contributing to the tourism that is the very cutting edge of globalisation. Alas, today, each one of us that flies to some ‘exotic’ destination, is being his very own Vasco de Gama or Christopher Columbus.